AN IRISH cleric has described the heart-wrenching scenes that unfolded in the wake of the horrific blaze that tore through Notre Dame cathedral in Paris. Monsignor Hugh Connolly witnessed the fire take hold of the cathedral first-hand and the desperate efforts of French firefighters to bring the fire under control. Speaking on RTE’s Morning Ireland, the Co Down native likened the aftermath to “a wake” with much of the French public in shock at the destruction of such an important national symbol. "It was like a wake,” he said. “People were sharing their memories, there were people praying, people singing, but largely a sense of disbelief and sadness really and sort of muted resignation I guess, as they saw the flames coming through that famous roof." Monsignor Connolly described how firefighters worked through the night to tackle the blaze and did eventually manage to salvage some of the cathedral’s most valuable relics. "From about midnight onwards, it seemed they (firefighters) managed to gain access and there are reports that many of the relics and artwork have been saved, that's still largely unconfirmed,” he said. "The big tragedy here, I suppose, is what they call 'La Charpente', the huge roofing frame, which is very, very familiar to people who've seen it, (the) most photographed monument, and 'La Fleche', which is the spire, and that very extraordinary moment was caught on television as the spire came crashing through the roof in flames. "Those, no doubt, since they are so well-known, well-photographed and well-documented, can be replaced but it will always be a replacement, it won't be the 13th/14th century craftsmanship which was such a spectacular sight to behold." 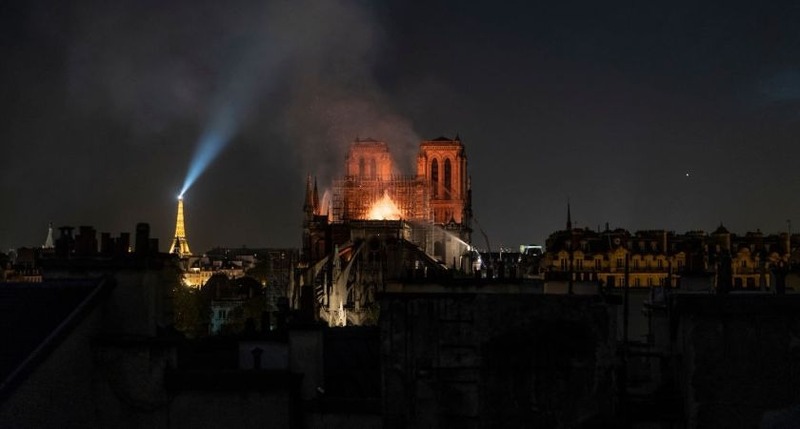 While Monsignor Connolly expressed sadness at the loss of the Cathedral, he was also able to reflect on the “enormous sense of solidarity” that has greeted the fire. "It was the living beating heart of the diocese, that was one of the things that the French do extraordinarily well,” he said. "It's an extraordinary crossroads but also an extraordinary living house of faith and that's also very sad to mention for people living here in the city this morning." "There's an enormous sense of solidarity which cuts right across boundaries. This is something that the president of the Republic said last night, it's simply not confined to those with spiritual values. "He called it the 'coeur et l'ame de la France', the heart and soul of France, and it is, an extraordinary crossroads of architecture, literature, art history, faith, commerce, tourism, it's a crossroads of life as well as being a crossroads of the city and therefore it has a huge place of affection in people's hearts here."